Organize and Secure your Expensive Equipment! 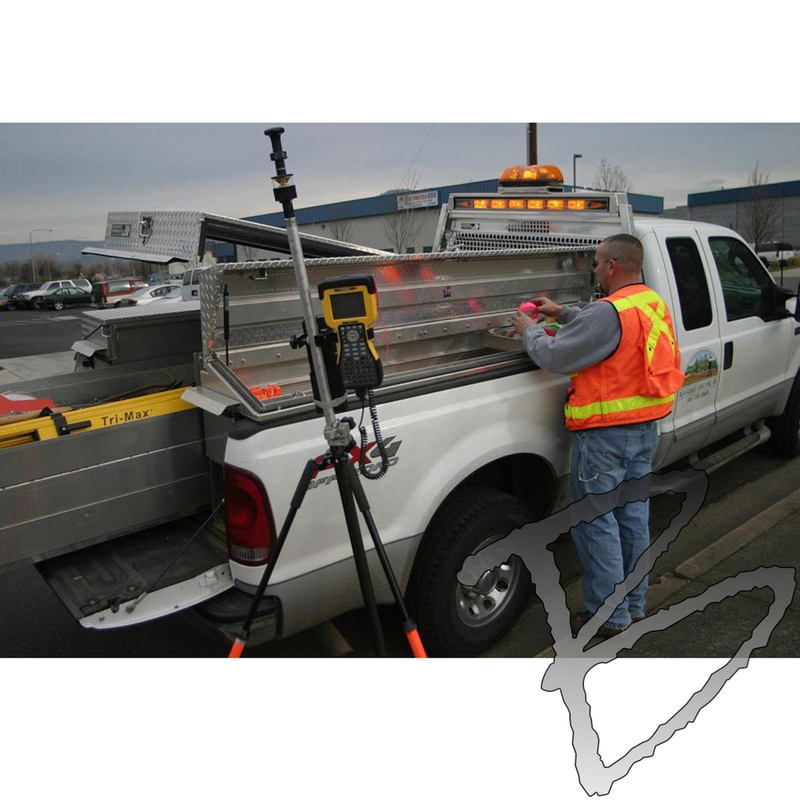 The Surveyor Pack™ is based on HPI's Pickup Pack* and built to meet a professional Surveyor's needs. 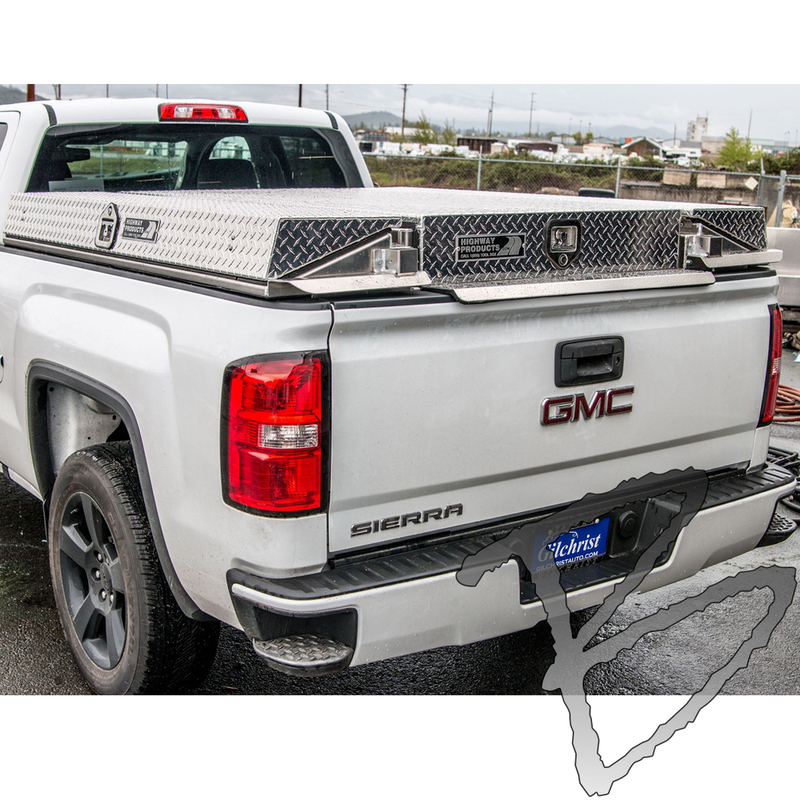 The Highway Products' Pickup Pack™ features an durable aluminum body that can be easily installed on your pickup truck in a few hours. 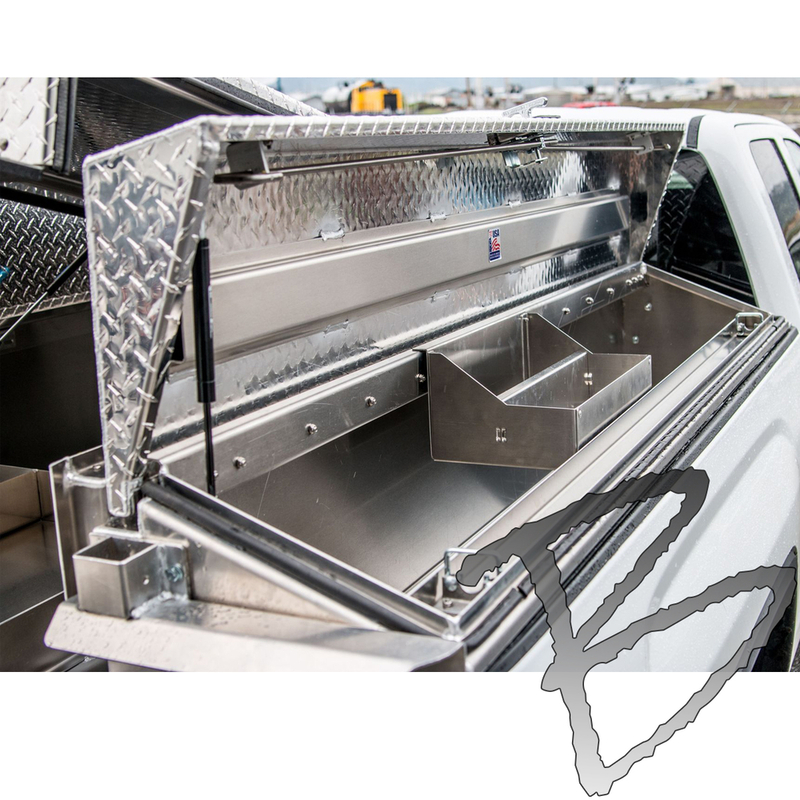 HPI's standard Pickup Pack* base model includes two lockable low-side boxes that run the length of the bed and a flat or domed center hatch. 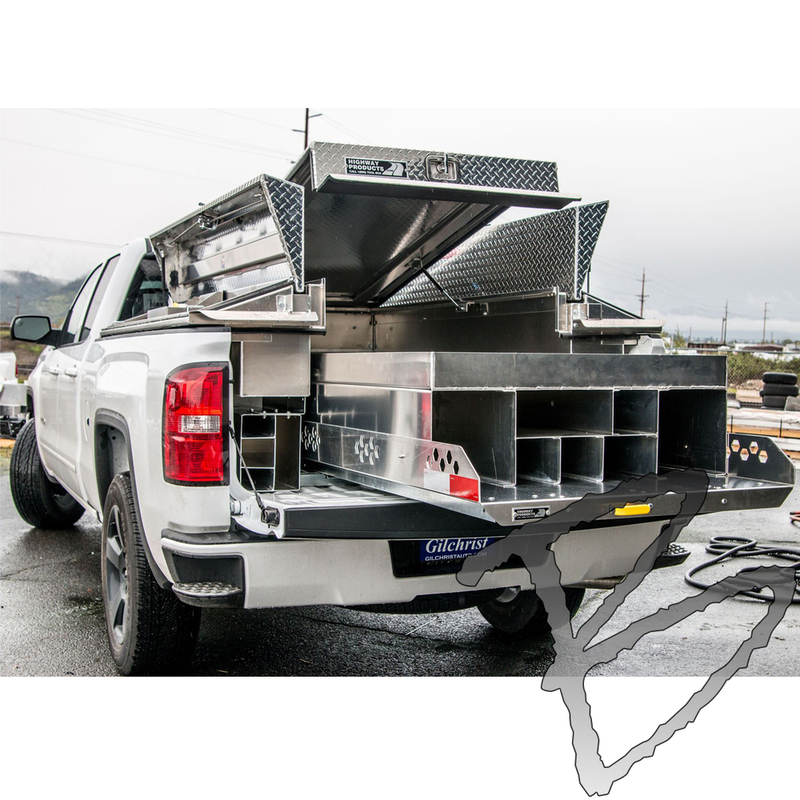 When closed, the hatch locks the tailgate, making the bed area secure and weather resistant, just like a service body, tonneau cover, or truck canopy would. HPI knows surveying requires some specific and expensive tools that deserve custom secure storage, so HPI created endless compartment configuration options so every tool has a home. 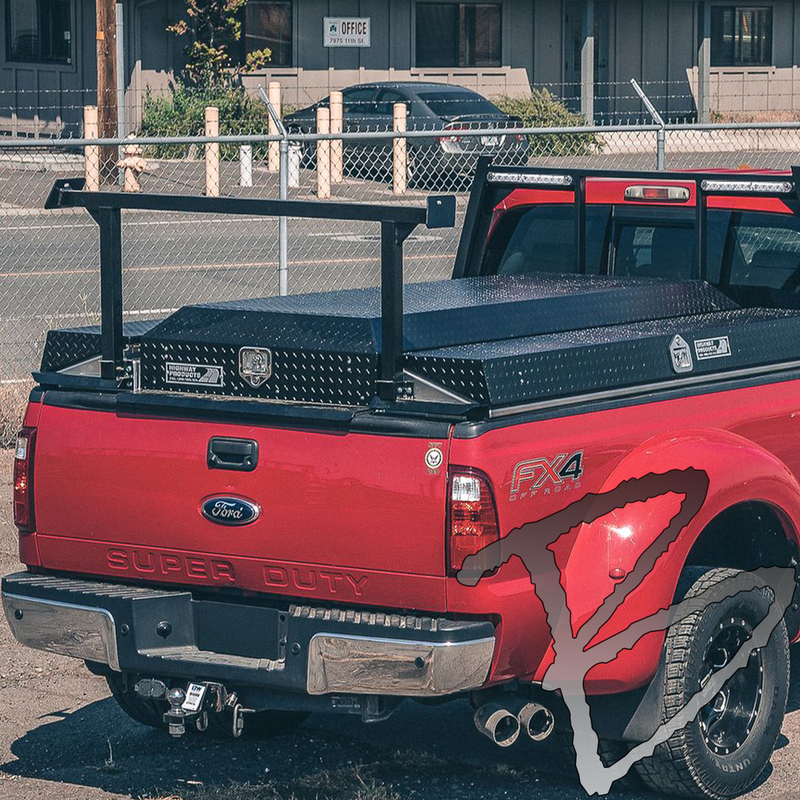 The Surveyor Pack™ offers extra functionality with the addition of our exclusive, back-saving Truckslide™, which turns the whole length of your truck bed into easily accessible storage. Customize the Surveyor Pack™ to match your job needs: add additional accessories and choose your favorite exterior finish style to complete your perfect build. Premier storage solution designed for surveyors. 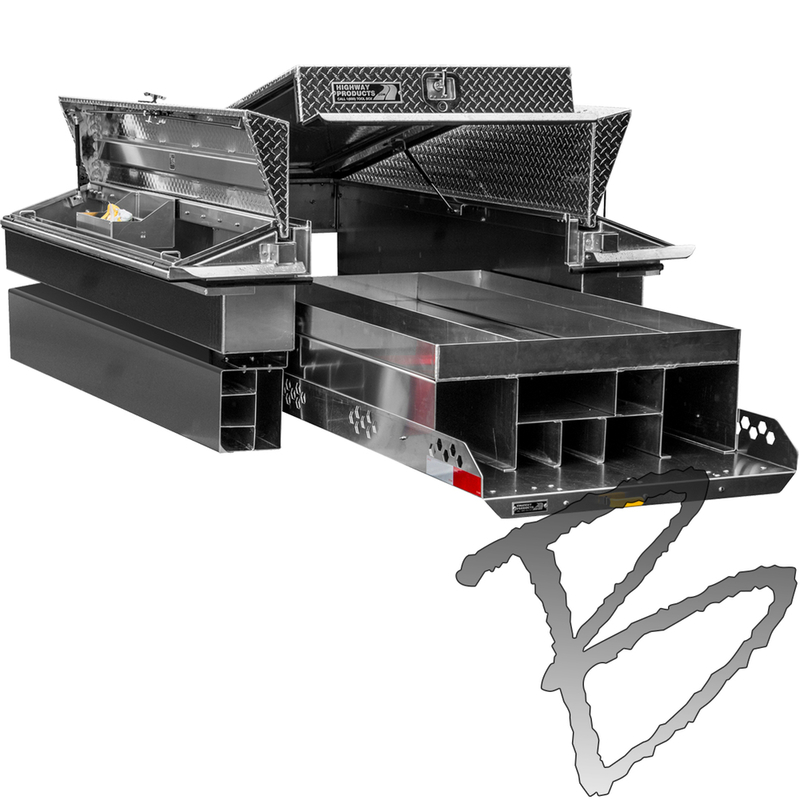 HPI engineered compartments for all of your equipment needs, maximizing organization and providing security that allows you to rest easy knowing your valuable tools and instruments are protected from weather and thieves. 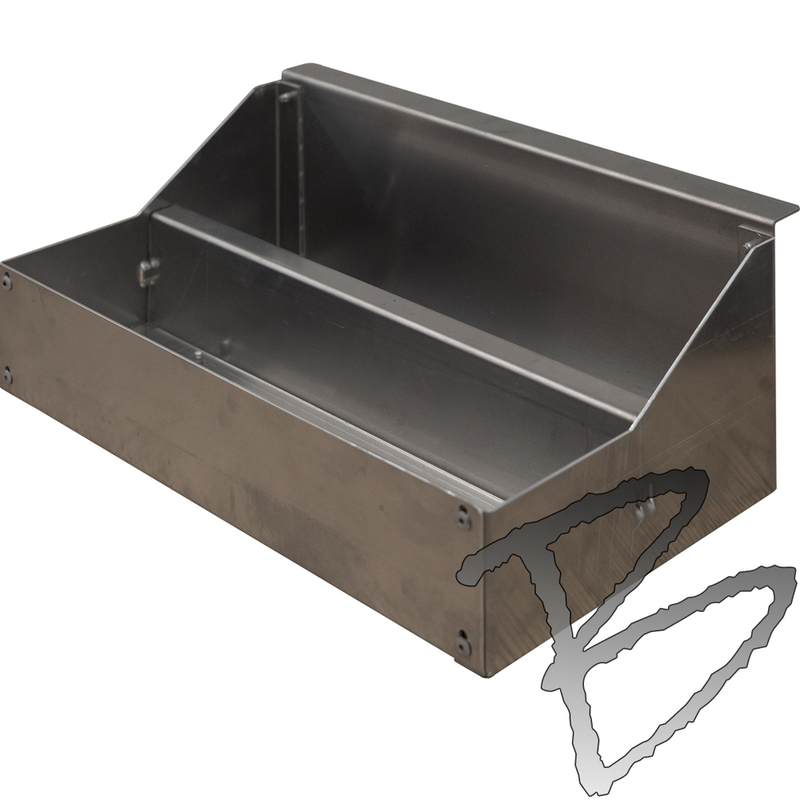 The lowside Boxes are designed with tapered lids that provide better visibility into the box, as well as providing lower, easier access. Internal rain gutters with automotive grade weather stripping seal the contents, and HPI's two-point locks keep everything safe from thieves. The Center Hatch props open easily with the two gas shocks, and can be removed altogether if needed. 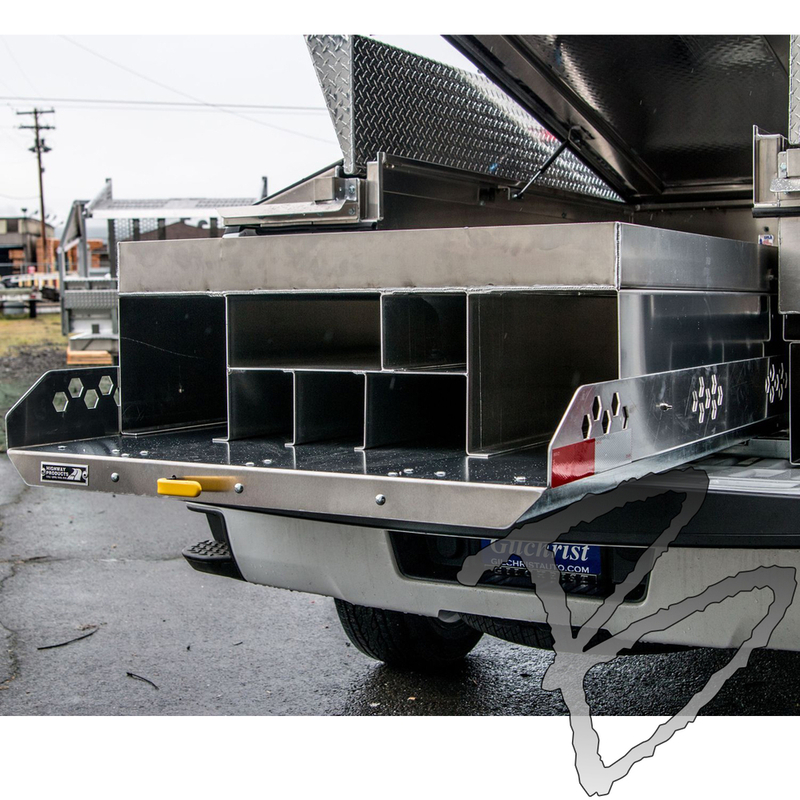 When the hatch is closed, the rear flange closes over the tailgate, preventing it from being opened. 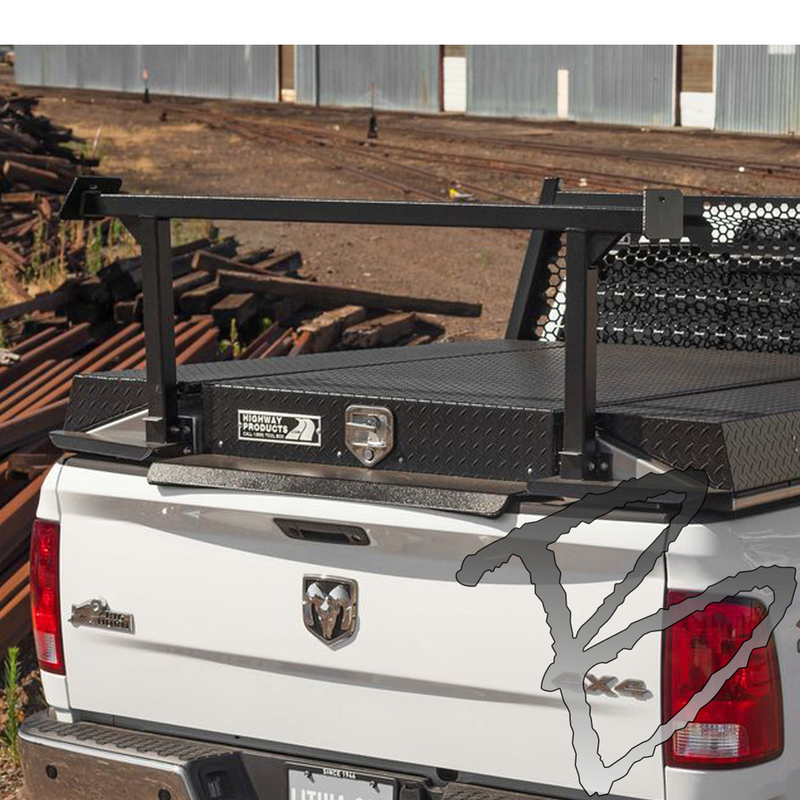 Pull and extend the slide to easily access materials without climbing into the bed of your truck. Galvanized steel rails with sealed 2" wheel bearings provide rugged durability, and HPI designed plunger rods that slam shut every 10" if the pull handle isn't activated to secure heavy loads. 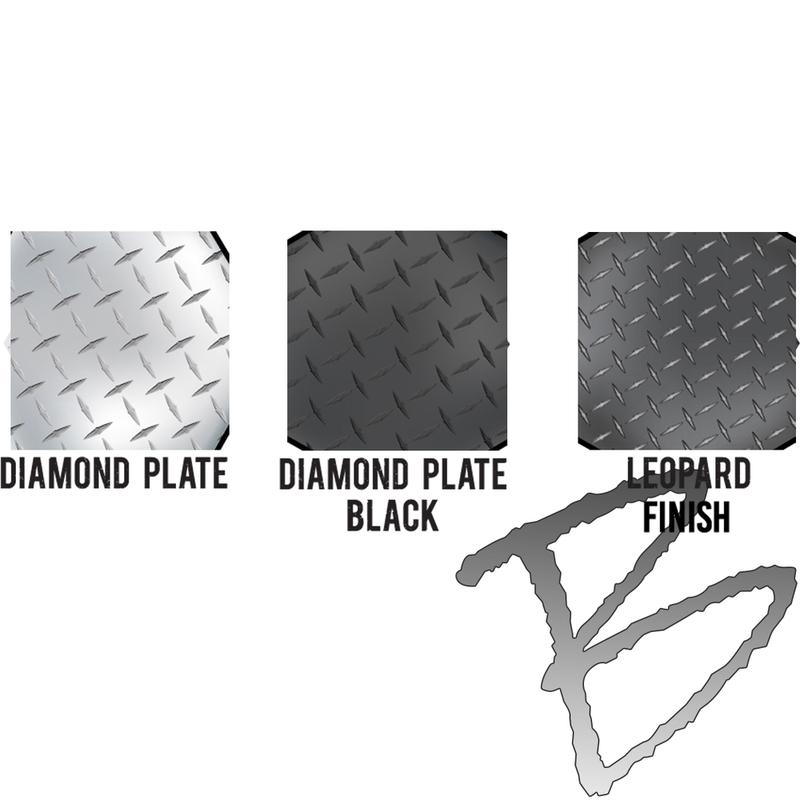 Layer on the protection and enhance your vehicles appearance to meet your specific needs and unique lifestyle. 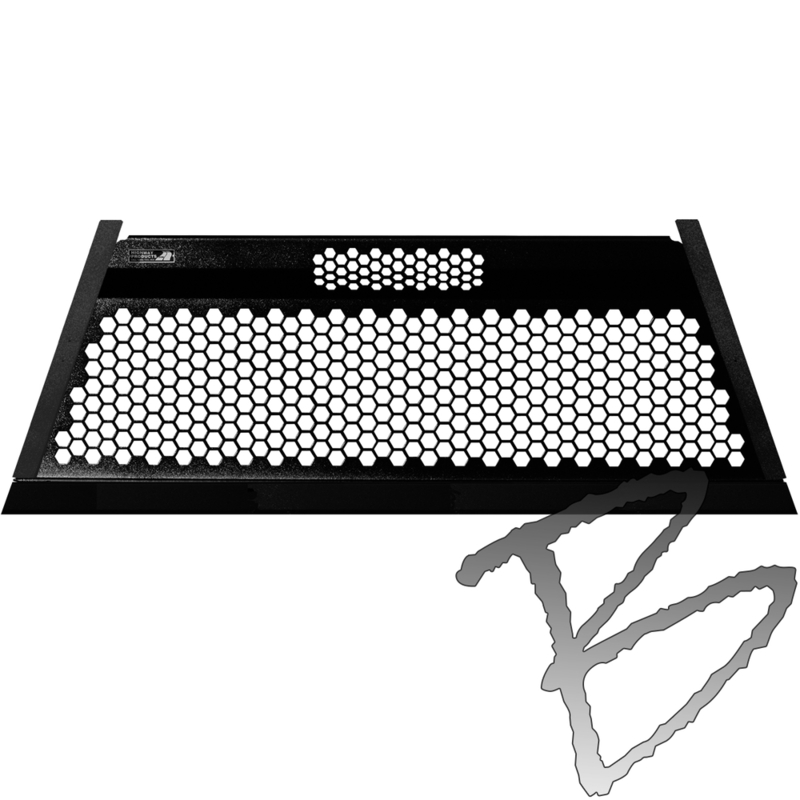 Choose between two different options; Honeycomb Mesh or Open Post Headache Racks. Rebar stakes, usually a nuisance, have their own compartments set at the rear of the truck bed providing easy access. All of the rebar stacks together nice and neat, preventing them from damaging other items in your truck. Options include Rebar Box on the drivers side ONLY, on the passengers side ONLY, or both sides. Please explore all of HPI's standard and optional features and call us with any questions you may have! Gas-Assisted Shock: Nitrogen-driven gas shocks raise the lid of your Surveyor Pack™ and keeps it open while you access your tools. The shocks are strategically placed so you can close the lid with one hand. Stainless Steel T-Handle Lock: HPI's ergonomically designed T-Handle locks are the most secure locking mechanism on the market. 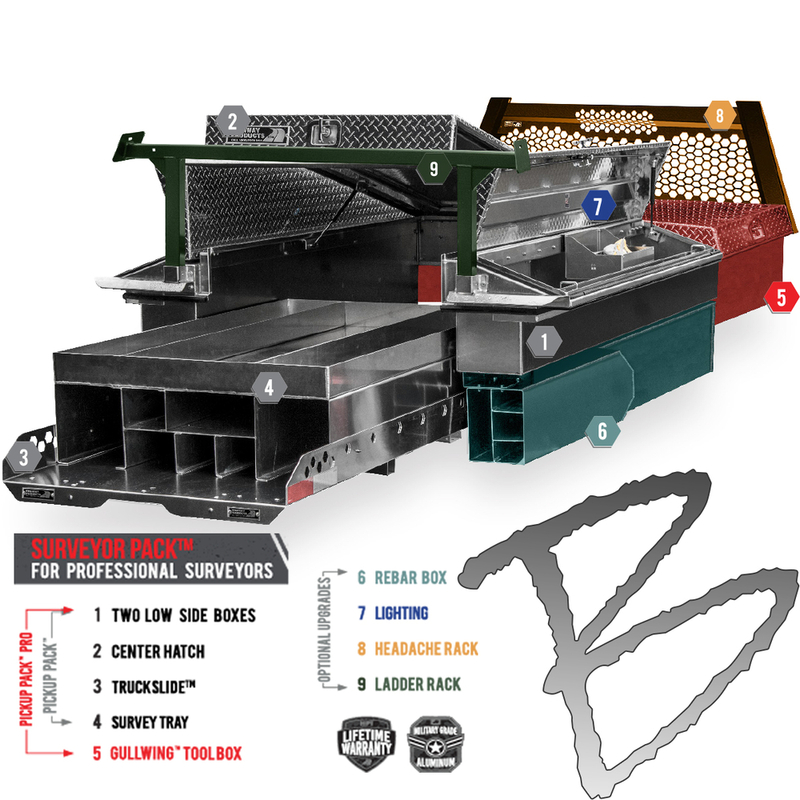 Removable Tool Trays: These durable aluminum tool trays sit high on the toolbox for easy access. Stainless Steel Hinges: We use oversized stainless steel hinges and 1/4" stainless steel pins that are 302 spring-tempered. Watertight Seal: HPI uses Clean Seal™ automotive stripping around the edges of each toolbox to ensure a watertight seal. 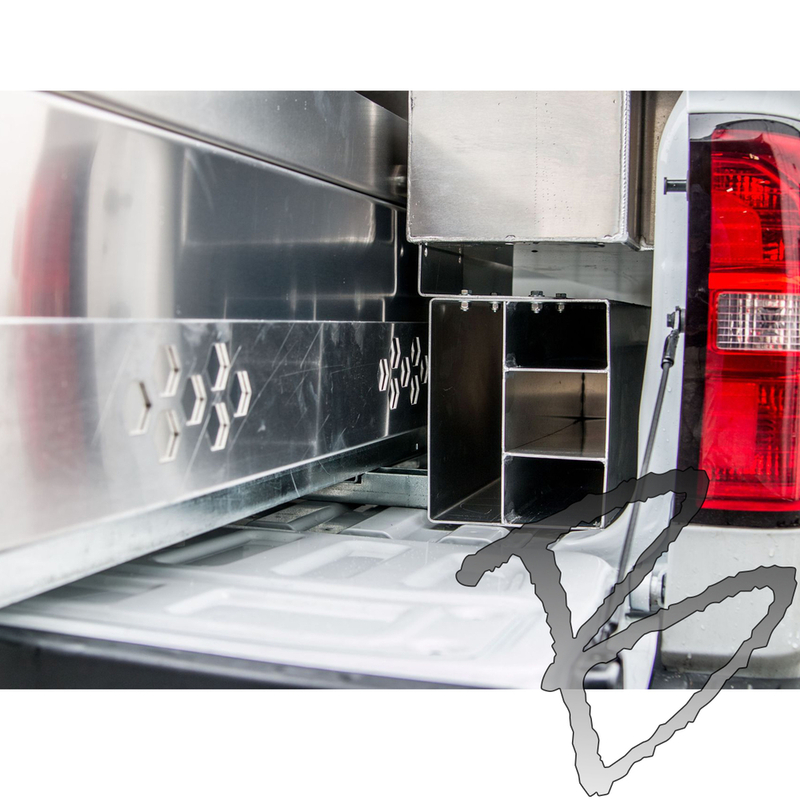 Low-Entry Design: HPI's rugged, low-entry door design is a great feature for taller 4x4 trucks. The side compartments put your smaller equipment at eye level, right where you want it. Truckslide™: With a Truckslide™ everything easily rolls out to where it can be reached! 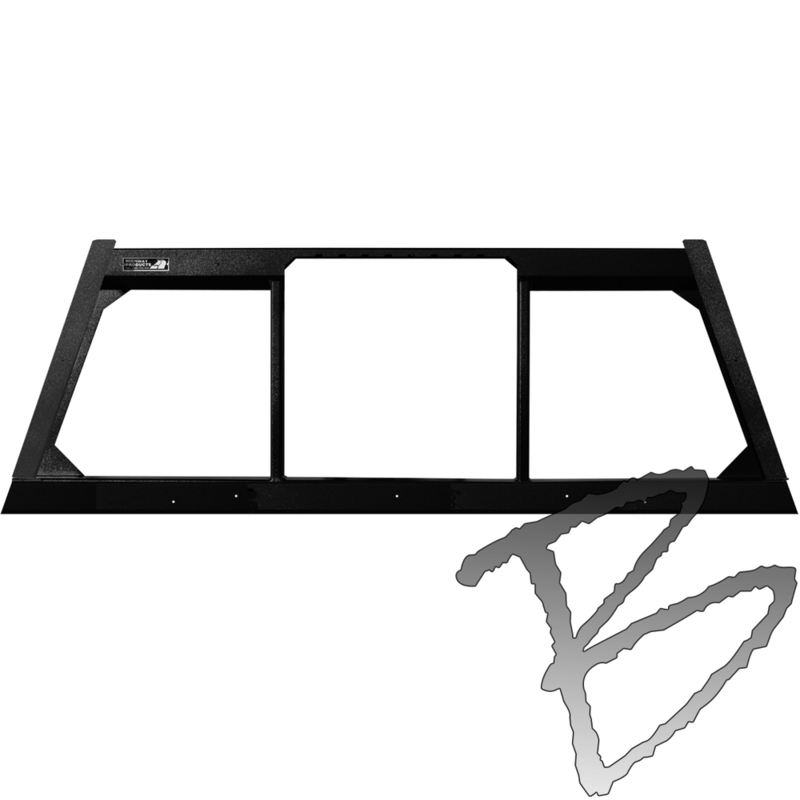 It works great in pickup trucks, vans, service bodies, and fifth wheel trailers. Gas-Assisted Cover: Nitrogen-driven gas shocks help keep you cover open while you access the bed of your truck.